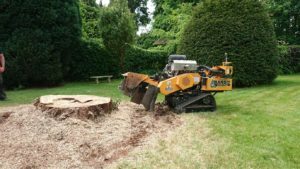 If you need a company to assist with stump grinding in Didsbury, Wainwright Stump Removal is one of the best stump grinders in the UK. Our team is fully equipped to handle a stump of any size. An old stump can be an eyesore in your back garden. When you are trying to do professional landscaping in your back or front yard, a stump can be problematic. We have over 25 years experience in professional stump removal and our reputation is unrivalled. Our qualified stump grinders can deal with tree stump removal no matter the size, shape or tree variety. We pride ourselves on delivering personal service that is guaranteed to cater to your stump removal needs. To have a stump removal in your compound, you need to contact professionals. In Didsbury, stump grinding is a complicated process and requires a lot of preparation. The size of the stump determines the machine we are going to use to execute the removal. Its position is also a major factor when it comes to which approach will be used to carry out the stump removal. A stump in open ground is easier to deal with than one adjacent to a fence. At Wainwright Stump Removal, we can handle any stump removal task. Whether a tree is a hardwood or softwood, we can deal with all the requirements for the stump removal. We can generate a quick quote if we have all the necessary information about the location, size, and variety of the tree stump. Access also determines the machine we are going to use and the cost of the process. When we come, we are always prepared. Wainwright Stump Removal carries out professional stump grinding in Didsbury. Call us today to deal with the tree stump on your porch. We have the machines and the expertise at our disposal to penetrate any nook and cranny. We deliver satisfactory service and even when we miss any section of the surface stump we will return to complete the job at no extra cost. The next time you are stuck with a tree stump in your backyard, contact the professionals.